A man with a bullet wound wakes up with memory disorders in an underground parking lot in Tel Aviv. As he struggles to recall recent events, a woman wakes up in a Shanghai hotel from a similar dream. A fragmented conversation with a pet shop owner on the phone sets off an abstract mystery in Tel Aviv and Shanghai. Insomniac City has been initially commissioned for the Venice Biennial of Architecture in 2004. It is a cinematic project that from its inauguration has set out to be worked in continuous stages. In 2006 additional shooting was made and the film was re-edited as well as in 2009 and consequently resulted in a long length film release. 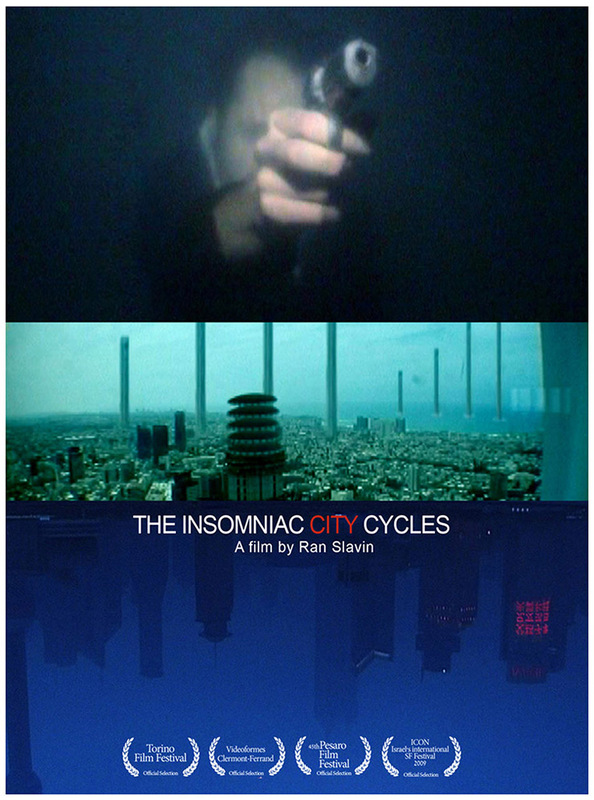 “Ran Slavin’s The Insomniac City Cycles work vacillates between reality and the imagination, wakefulness and sleep, and creates an affinity between the psyche and the urban sphere. The film’s fragmented, frenetic and haunted urban topography may be likened to a map of the human soul. The emotional condition of this work’s protagonist, which makes it impossible for him to escape into the realm of sleep, represents an existential state. Paradoxically, this state of continuous wakefulness resembles a dream, or rather a nightmare, in which it is impossible to tell the difference between truth and fiction. When he wakes up in a parking lot with a bullet wound in his shoulder, he cannot remember how he got there, where his pistol is, and whether he is the victim or the murderer. The few instances in which he manages to recall moments from the past involve images of southern Tel Aviv as seen from the ground.” – Sergio Edelsztein, head of the CCA Tel Aviv. An altered map, an imaginary island, like some sort of superfetation along the coasts of Israel: against the backdrop of this scenery, the digital trance of Ran Slavin’s The Insomniac City Cycles takes its course. There is a man in a deserted garage, behaving as in a catatonic world, he realizes he is hurt; from deep down in his psyche, a voice within seems to appear, the man reflects on what has happened, on his own identity. With the very first images of the video, a sense of painful alienation, of psychological vulnerability makes itself felt. The protagonist’s search takes place inside and outside of urban places, on streets blinking with neon signs, in rooms and in halls, representing the convolutions of the mind. Other characters appear from time to time, one after another; reference points intertwine to form a narration, which completely abandons linear story-telling and progresses by means of repeated flash-backs at a dense, tense and unsteady rhythm, carrying everything away with it. A crime brings the story to an end; the video leaves us only with a few hints, but won’t allow us to uncover the secret completely. In the character’s perception distorted by hallucinations, the boundary between day and night becomes blurred; time and space combine into a sensation of dynamic tension. The city – the actual protagonist – shakes, the buildings bend, lift and lower again, penetrate each other. The urban space of the modern megalopolis – seen through the deformed lens of a desperate emotionality – lives as in symbiosis with the protagonist; his instability reflects and reinforces the impression of alienation. The sense of disorientation is conveyed by the fragmentation and the multiplication of viewpoints: we’re in Shanghai, we’re in Tel Aviv, or in any other place not clearly indicated, everything is always in a state of flux. The organic relationship between sound and image contributes to creating an atmosphere in which the habitual patterns of perception, as well as the usual acoustic and visual orientation loose their basis and matter itself seems to continually evolve from one phase to another. Ran Slavin’s images reference crime and fantasy movies but they also exhibit a visionary quality which calls Fritz Lang’s Metropolis or David Lynch’s Inland Empire to mind. The Insomniac City Cycles can be understood as an unreal thriller; a journey through altered levels of consciousness, which allow to transcend everyday life, to access spheres of the subconscious, even though our body and mind guard it as something inalienable, and even though it constitutes unconscious memory. Past and present, the awareness of time and death, worlds which break up into pieces, overlap, and weave into a kaleidoscopic, unreal journey, inwards, inside the many rooms, which exist inside of us; underneath all of this, there lies the difficulty of daily life and the instability, which nests behind conventions and stereotypes. But there is also the habit of a visible continuity, which replaces the overlapping in space, as well as the proper grasp of place, experience and personal identity, which have undergone a transformation: a transformation in the sense of giving up any kind of complacent posture in favor of a direct and emotional perception, of the stretching of one’s own boundaries, of a connection to a wider context: this is about a new approach to understand man’s existence in the world. In Ran Slavin’s piece of work, all of this becomes a psychedelic narration, a creation of anxiety, reflecting the complexity and growing instability which characterize the era we live in. – Gabi Scardi, art curator and critic. The Rabinovich Foundation for the arts – Cinema Project, Israel Lottery Council for the Arts, Sheraton Tel Aviv, Giora Einy, Alon Garbuz, Yoav Abramovich, Yoav Barkai, Danny Spaer, Daniel Shabtai Milo, Itzik Cohen, Omri Levi, Irad Mazliah, Avi Banon, Monika Bielskyte, Ohad Naharin, Shiri Slavin, Sigal Barnir, Yael Moria, Rei Elbaz, On Air, Michal Shalit, Keren Arnaldes, Bernd Lennartz, Achim Szepanski, Itai Meir, Shablul pet shop, Shlomit Slavin, Ritsko, All the crew, Oded Horowitz – Orlando Films.